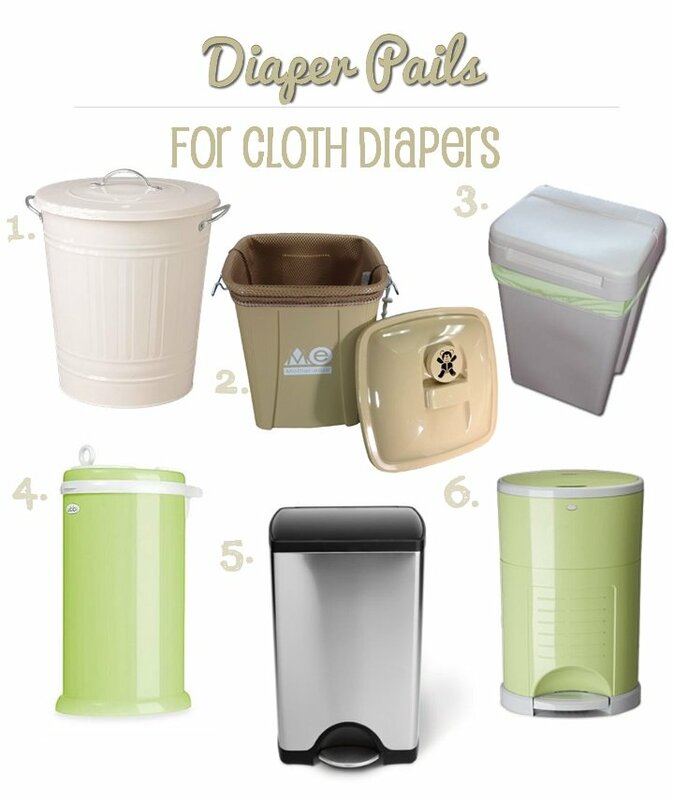 A reliable cloth diaper pail is one of the absolute must-have cloth diapering accessories! Cloth diaper pails are used to store soiled cloth diapers until you are ready to do laundry. Read on to understand the differences between various cloth diaper storage options. We've also got some suggestions to eliminate diaper odors, if you are worried about smelly diapers. Dry pail storage is the most common method used today to store cloth diapers. The waterproof bag is usually used to line a lidded garbage can, pail, or other container. Bags are sometimes hung on a hook or door knob, eliminating the need for a pail. Be sure to remove any solid poop before putting it into the bag - don't worry about it if your baby is only on breast-milk, since this poop will wash out easily in the washing machine, with no pre-rinsing required. If you are planning to use a pail liner, ones with elastic around the top hold it more snuggly on the can. This means your bag won't slip down inside the cloth diaper pail like a garbage bag does in your regular trash can. Read more about pail liners here. If you're the DIY type, you can also make your own pail liner by following our diaper pail liner tutorial. An inexpensive flip-top garbage can is usually best, since it allows air to circulate, but if you have nosy pets or kids, you may prefer one that opens with a step-on pedal and can't be tipped! It is usually best to get 2 pail liners. The used one goes in the wash with the dirty diapers, and the clean one is ready to go right away so you can re-line your pail. Diapers are soaked in a sealed pail that contains a small amount of water. The water helps to pre-treat diapers and reduce staining and odour. May use additives such as vinegar, Borax, baking or washing soda, essential oils, or Bac-Out stain remover in the water. Wet pail methods work better with top-load washing machines, where the contents can be dumped into the machine easily. Wet diaper pails are a drowning hazard for kids and pets, so if you plan to use the wet pail method, be sure to get a waterproof, lidded container that locks tightly and be vigilant about sealing it after every use. Wet pails can be very heavy if filled too full, so be careful not to be tempted to buy an over-sized pail! 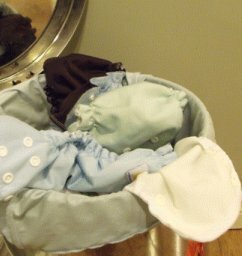 Wet pail methods can be tough on diaper fabric, so dry storage of the covers and shells is a much better decision. Tip: If you will have more than one child in diapers at a time, consider buying a larger diaper pail, so you can still store at least 2 days of diapers before you need to do laundry. 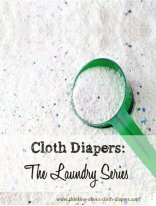 Note: If you are planning to use a diaper laundry service, you'll want to follow their recommended storage methods. Diaper services usually provide a large pail and liner, since they only pick up diapers once a week. Wash your diapers every 2-3 days. Over time, urine breaks down to uric acid, which creates an odor, and can cause damage to the fibers in your diapers and elastic. The longer you wait between washes, the more set-in stains become. 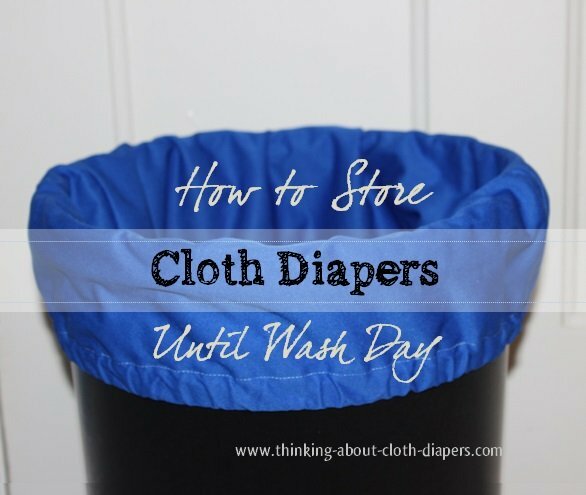 It's best not to get an over-sized cloth diaper pail - it's so easy to be tempted to put off laundry when you still have room in your diaper pail - but this is bad for your diapers, and for your nose! Disinfect your diaper pail after every use. If you are using a pail liner, buy two of them. You can simply turn the pail liner inside out into your washing machine, dumping the diapers in, and then add the bag directly to the wash. You have a second one to re-line the cloth diaper pail right away, so you can keep changing diapers even if you get behind on moving the clean ones to the dryer! Bamboo charcoal - as moso bamboo plants mature (taking 5 years), tiny pores are created that absorb allow it to act as a deodorizer. These products can last up to a year, and can be recycled or composted after. They absorb odor, moisture, and chemicals such as formaldehyde, ammonia, and benzene that can build up in your cloth diaper pail as soiled diapers are stored. Essential oils, such as lavender and tea tree oil - these are best applied to a rag that is then added to the diaper pail. I would caution against using tea tree oil, as it can be toxic to pets, a fact we didn't realize until our pet ferret was sick and our vet thought it looked like poisoning... luckily, it wasn't, but we won't buy anything with tea tree oil in it now. Rinse your diapers (or just inserts) before you store them to remove a smell. When my little boy was teething, I found rinsing the diapers helped keep the acidic urine smells down. We used a diaper sprayer (also called a mini shower), but you can dunk and swish in the toilet if you'd rather not invest in the sprayer. You can buy hanging wet bags from most cloth diaper retailers, or you can choose a sturdy diaper pail to store your cloth diapers until wash day. Almost any container can be repurposed as a diaper pail. Regular swing-top or step-on garbage cans work great. When we asked on Facebook, we found out that some moms re-use the pails that kitty litter comes in. Some moms even use a regular laundry basket or hamper. A good diaper pail is a must-have accessory for cloth diapering! The smells associated with dirty diapers are often a result of the chemicals in disposables, but even the stinkiest of dirty cloth diapers can be stored in a diaper pail for a couple of days without a problem.